Do strike starts at 5:20. Do strike (do-uchi) is very easy after learning men strike and kote strike. Basically lift up your sword just like when we strike men. However, we have to change the direction of the sword so that we can cut our opponent's right waist. As explained in men strike, kyodo means "movement" so sankyodo means three movements, nikyodo means two movements and ikkyodo means one movement. 1. Lift up our hands right above our head from chudan and take a step forwards onto the right foot on a command, "Ichi!". 2. Strike do on a command, "Ni!" 3. Take a step backwards and go back to chudan on a command, "San!" 1. Sankyodo Do Uchi, Hajime! Repeat 2 to 4 until the commander shouts "Yame (Stop)". The practitioners shout, "Do!" as striking a do on a command, Ni! Now you bring your sword right above your head as you do when striking men. So other than kote strike, we bring our hands right above our head. It is easier for practitioners to grasp what they are doing if there is someone in front of them standing. It is becuase the practitioners have something to aim at. If we don't have a person to aim at, the do height is about the same as kote height, parallel to the floor. However, this time the angle of your sword is different. It is angled diagonally down to the right. We change the direction of the sword only using our wrists. Some people tend to lean their body to the left to change the direction of the sword. Remember, we always keep our body straight. 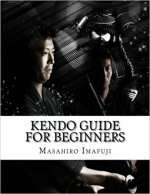 Once the practitioners acquire how to change the direction of the sword, then can move to Nikyodo Do Uchi. 1. Lift up our hands right above our head from chudan and take a step forwards onto the right foot and strike do on a command, "Ichi!". 3. Take a step backwards and go back to chudan on a command, "Ni!" 1. Nikyodo Do Uchi, Hajime! Repeat 2 to 3 until a commander shouts "Yame (Stop)". The practitioners shout, "Do!" as striking a do on a command, Ichi! We have only one movement. 1. Lift up our hands right above our head from chudan and take a step forwards onto the right foot, strike do, take a step backwards and go back to chudan on a command, "Ichi!". 1. Ikkyodo Do Uchi, Hajime! Repeat 2 until a commander shouts "Yame (Stop)". These are the methods of the really basic do strike training. Kindle version is available too. Check Amazon in Your Country.